Superstorm, Frankenstorm, Halloween Ruiner. Regardless of its nickname, Hurricane Sandy ravaged much of the east coast, causing severe, and in some places, irreversible damage. However, people were not the only ones put in grave danger by this storm. While many of New York City’s weak swimmer rats drowned, many domestic pets were also displaced from their homes. There is some good news. New York City has rallied around protecting the lives its domesticated animals. According to USA Today, all of the shelters in New York City accepted refugee pets, which legally they are not required to do. The efforts being made are a grim reminder of the results after Hurricane Katrina in 2005, which left approximately 250,000 pets homeless. It is unknown just how many animals were killed or subsequently died of dehydration/starvation in wake of Katrina. To avoid a repeat of this type of tragedy, city hotels that are usually not animal-friendly have waived restrictions and allowed pets to stay during the disaster. It remains unknown whether they were entitled to room service. There were a few voices supporting animal rights and the importance of a safe haven during and after the storm. Tim Rickey of the ASPCA says, “”If your home isn’t safe for you, it’s not safe for your pet. Once you evacuate you never know when you will be back.” Furthermore, ASPCA at large is helping out in three major ways—by distributing pet supplies at several key points, providing veterinary care, and rescuing animals who were left behind. To donate to ASPCA’s Sandy relief efforts, visit here. If you are a pet owner affected by Sandy, here is critical information provided by the Huffington Post: (1) Lost and Found (all affected areas): A Facebook group called “Hurricane Sandy Lost and Found Pets” is trying to facilitate reunions of pets and their owners by giving people a place to share photos and information. Many of the pets disappeared when doors or gates blew open in the high winds, or when they slipped out of their collars. (2)Left-Behind Pets (NY): For New York City evacuees who need to report pets who were left at home during the storm, call the city’s hotline at 347-573-1561. (3) Pet-Friendly Shelters (all affected areas): You can find listings of pet-friendly shelters from Global Animal and the Examiner. Although the law does not require officials or local government to protect a pet from harm’s way, FEMA has stepped and advocates for animals on its website with specific recommendations for preparing pets for inclement weather. Agency suggestion like this is a step, though a small one, in the right direction. I live on Staten Island, in one of the worst hit areas. Staten Island Feral Initiative (SIFI) http://www.siferalinitiative.org/index.php?option=com_content&amp;;view=article&id=7&Itemid=14%20, is also doing good work in the area. Surprisingly enough, many outdoor cats survived, where dogs didn’t. The cats seemed to know where to go to keep safe. I’ve been looking after a few on my street, which is basically a disaster zone. Amazing little survivors. I’m grateful for every single person who helped animals in any way during and after the storm. 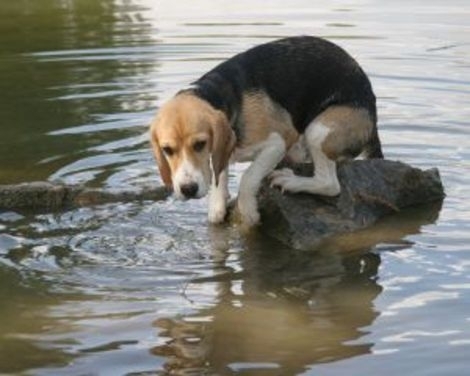 And I trust that sweet beagle was rescued and found his way back into his guardian’s arms.